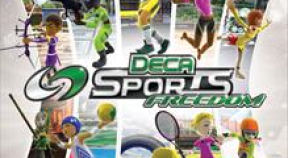 DECA SPORTS FREEDOM The wait is over! The ultimate sport experience is here! DECA SPORTS,the hit sports game series with 2 million copies sold worldwide, is now on the Xbox 360! The intuitive and dynamic control of Kinect combined with the HD graphics of the Xbox 360 deliver an unprecedented experience in sports gaming that makes you feel like you are actually there!